On 20 January 2009 the Regulation on classification, labelling and packaging of substances and mixtures entered into force. It aligns existing EU legislation to the United Nations Globally Harmonised System (GHS). 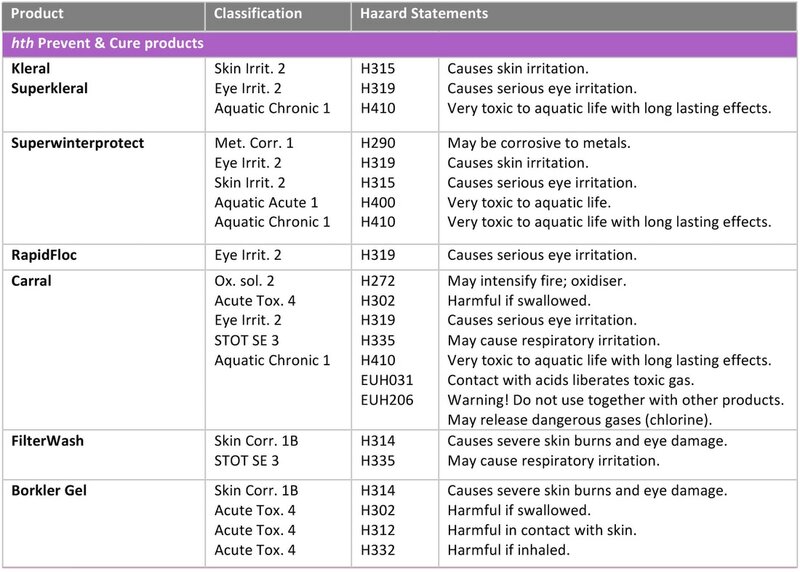 This new Regulation on classification, labelling and packaging (“CLP Regulation”) contributes to the GHS aim that the same hazards will be described and labelled in the same way all around the world. By using internationally agreed classification criteria and labelling elements, it is expected to facilitate trade and to contribute towards global efforts to protect humans and the environment from hazardous effects of chemicals. These classifications are hazard and not risk based. Therefore, risks are minimized when the product is handled with careful observance of the instructions for use. Classification pertains to the product, as sold, within its container, and will not apply to the treated water (pool or spa). See below for current (as at 01.01 2017) CLP information on our products.